BANGKOK – Rainfall in the northeastern region has caused flooding in the city of Bueng Kan province, while the Chao Phraya Dam prepares to funnel water through the western and eastern regions and into the Gulf of Thailand. The Meteorological Department reported today that the southwestern monsoon over the Andaman Sea and southern Thailand will result in higher precipitation until September 7th. 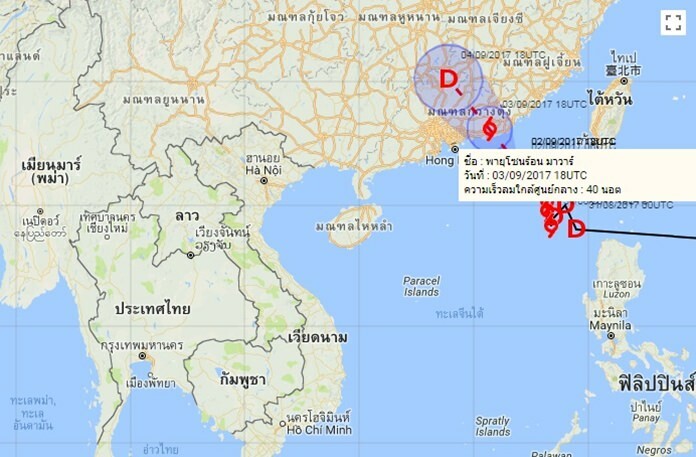 Heavy rainfall will occur in certain areas of the northern, northeastern, central, eastern, and southern regions, while waves in the Andaman Sea are expected to rise to 2 meters. Meanwhile, Tropical Storm Marwar has made landfall in China, but is not expected to affect weather conditions in Thailand. In Chai Nat province, water has flowed into the Chao Phraya Dam at a rate of 1,876 cubic meters per second. The dam is maintaining its discharge rate of 1,498 cubic meters per second to prevent exacerbating the impact on waterfront areas downstream of the dam. The dam plans on channeling water into the Makhamthao-U Thong Canal and the Tha Chin River, which will then flow through Suphan Buri and Nakhon Pathom provinces into the Gulf of Thailand to the west. To the east, the dam plans on channeling water into the Chainat-Ayutthaya Canal and the Chainat-Pasak Canal, which will then flow through Lopburi and Pathum Thani provinces. The water diversion plan will help reduce the effects on downstream provinces, such as Sing Buri, Ang Thong, and Ayutthaya. Meanwhile, Pathum Thani province is releasing water from Rangsit, Prem Prachakon, Hok Wa Sai Lang, and Peerapat Yaek Tai Canals to facilitate the drainage of water from the Chao Phraya River into the Gulf of Thailand. In Bueng Kan province, persistent rain has caused flooding in the capital district’s communities and roads, some of which are 30-50 centimeters under water. Flooding has also affected the staff homes of Bueng Kan Hospital personnel, and Bueng Kan Pitak Suksa School. Military and hospital officials have installed water pumps, which are expected to demonstrably relieve the area within a day.